Mark Golitko, assistant professor of anthropology at the University of Notre Dame, worked with colleagues from the Field Museum in Chicago and institutes in Australia, New Zealand and Papua New Guinea to study the Aitape Skull and the area it was found in. 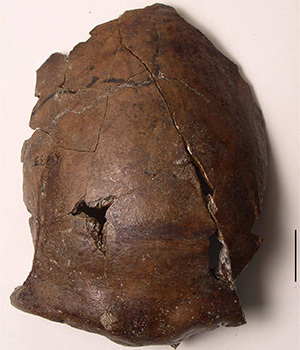 In a new PLOS One paper published Wednesday (Oct. 25), the researchers lay out evidence showing that the skull was victim to a violent tsunami that struck the coast about 6,000 years ago. “Diatoms make little silica shells around themselves, and when they die, those sink to the bottom,” Golitko said. “So we put the sediment under a microscope and counted these diatoms, and it more or less tells you about the temperature, salinity and how energetic the water was that they were living in. Golitko hopes this study can help start a conversation about how people adapt and thrive in these coastlands that are subject to tropical storms, earthquakes and tsunamis — the Aitape region has endured several tsunamis; the most recent in 1998 killed more than 2,000 people. People likely started moving from the mountains to the coastlines in this area around 6,000 years ago, Golitko said. Golitko co-authored the paper, “Reassessing the environmental context of the Aitape Skull — the oldest tsunami victim in the world?” with James Goff and Darren Curnoe, University of New South Wales; Ethan Cochrane, University of Auckland; Shaun Williams, National Institute of Water and Atmospheric Research, New Zealand; and John Terrell, Field Museum of Natural History, Chicago. Their research was contributed to by the University of Papua New Guinea, the Papua New Guinea National Museum and Art Gallery and l’Université de Bourgogne-Franche-Comté. Originally published by Brittany Collins Kaufman at news.nd.edu on October 25, 2017.